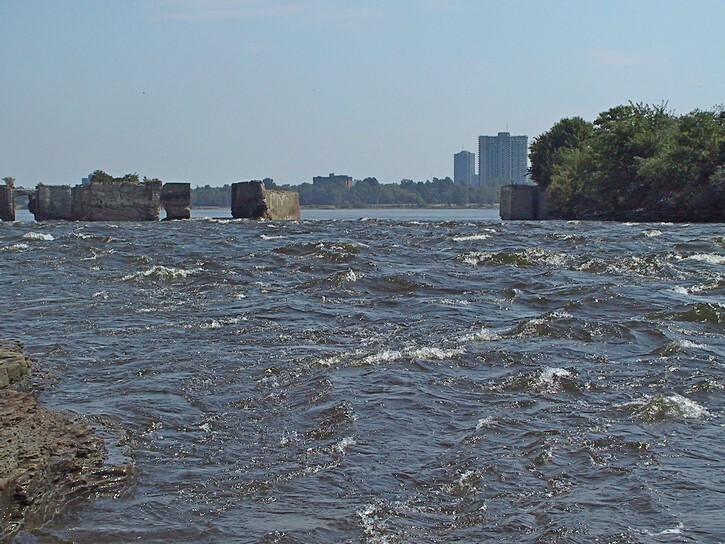 The ride to Aylmer takes place on a good quality pathway and offers some very interesting views of the Ottawa River and the Deschênes Rapids. From downtown Gatineau (Hull sector), it is a matter on getting on the Voyageurs Pathway and heading west. If you are coming from the Ontario side of the river, it is necessary to cross one of the downtown bridges or the Champlain Bridge in the west. The Champlain, Alexandra, and Portage Bridges all have bicycle laneways. Of these bridges, the Champlain Bridge offers the easiest way to connect to the Voyageurs Pathway. A return trip from downtown Ottawa to the Aylmer would probably be around 30 to 35 kilometres (a little more if you return via the Pionniers Pathway). When in downtown Gatineau (Hull), you can get on the Voyageurs Pathway opposite the intersection of Montcalm Street and Alexandre-Taché Boulevard. For the next couple of kilometres the pathway has quite a few twists and turns, and even one or two small hills. It starts to straighten out and gets flatter once you reach Moussette Park. This small park has a nice beach as well as a snack bar and other public facilities. However, since the pathway goes right through the middle of the park, you will have to pedal very slowly in order to navigate around the many people who make use of the place on hot summers days. 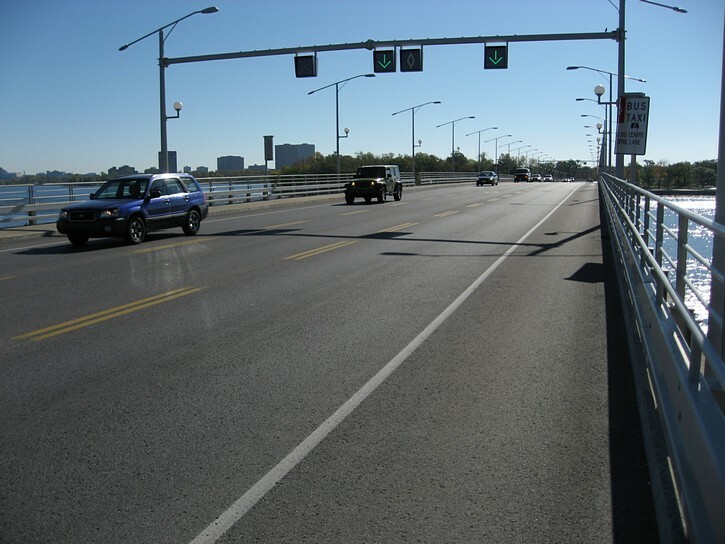 The pathway passes under the entrance to the Champlain Bridge, meaning that there is no need to deal with the heavy traffic on the roads leading to and from the bridge. For cyclists coming across the Champlain Bridge from Ontario, it should be pointed out that they might want to take a short detour onto Bate Island. 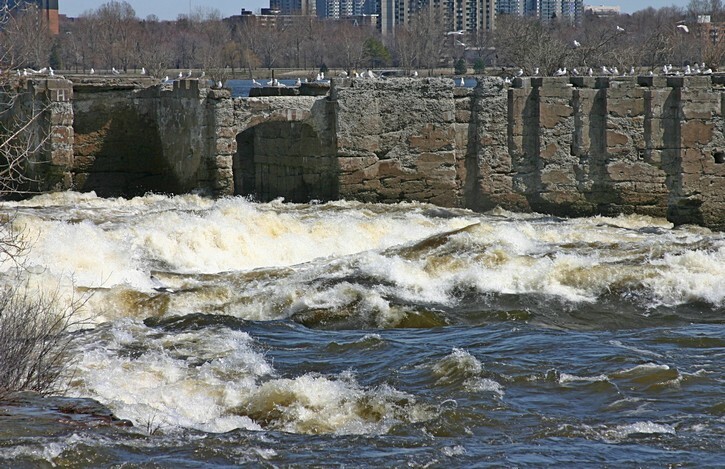 When the Ottawa River is high and running fast (mainly in early spring), Bate Island is a real hotspot for whitewater (slalom) kayaking. 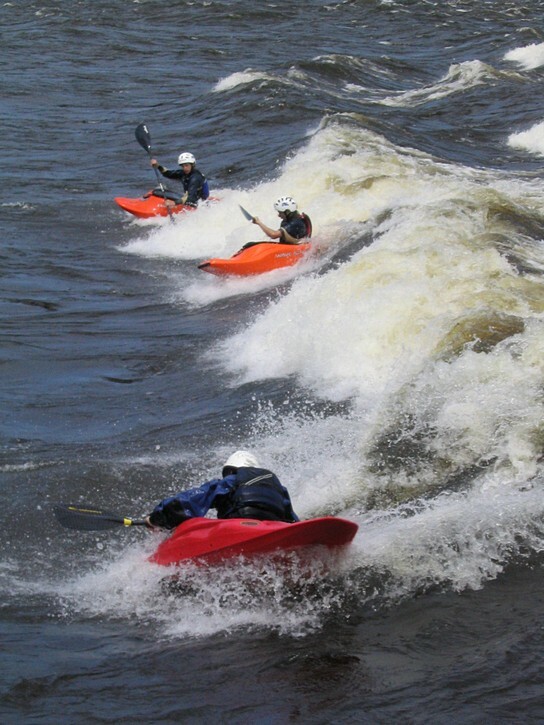 If conditions are right, you often find a group of kayakers as they perform some impressive manoeuvres, including spins, flips, rolls, cartwheels, etc. You will have a front row seat because all this happens only a dozen metres from shore. It is well worth the stop. 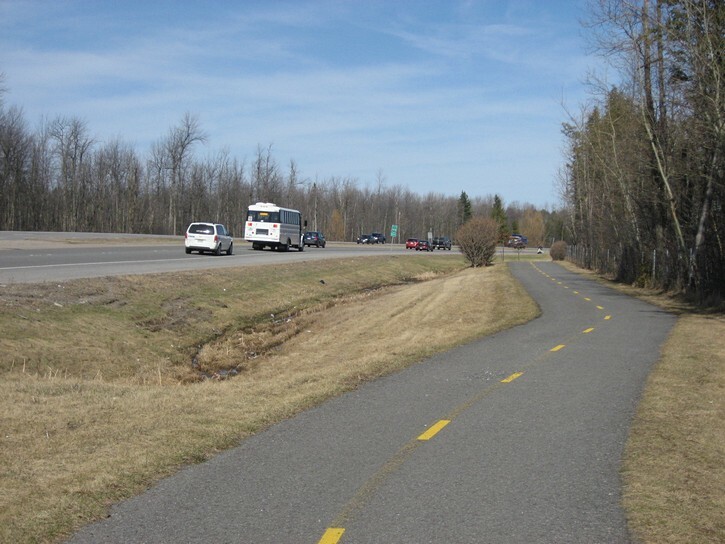 Continuing on the Vogageurs Pathway west of the Champlain Bridge will bring you into a wooded area for 4 to 5 kilometres. This wooded area separates the pathway from Lucerne Boulevard to the north, but it also blocks the view of the Ottawa River to the south. 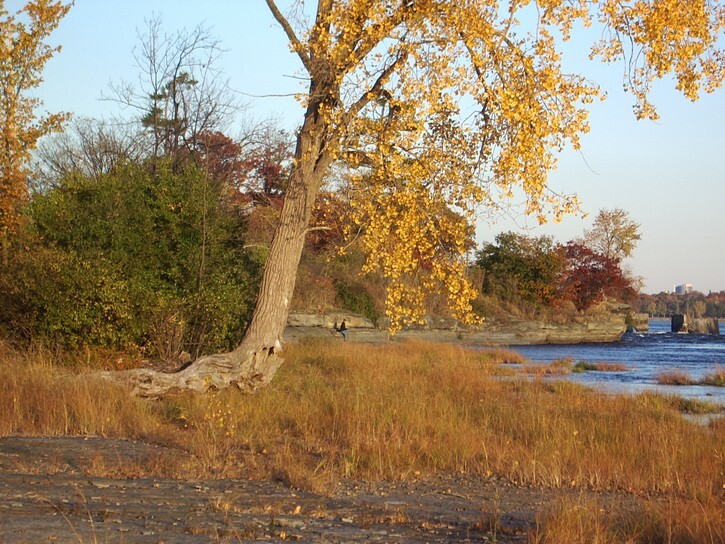 There are some side paths that allow you to get to the water’s edge, but these are dead ends. It should be noted that this section of the Voyageurs Pathway looks like it wasn’t built that long ago. It has a good paved surface and is a little wider than many of the other paths in the National Capital Region. This last point, along with the fact that roller-bladers, pedestrians, and cyclists tend to make an effort at accommodating each other’s needs, means that there may be slightly less congestion on this path on busy weekend afternoons (but you can’t always count on this). 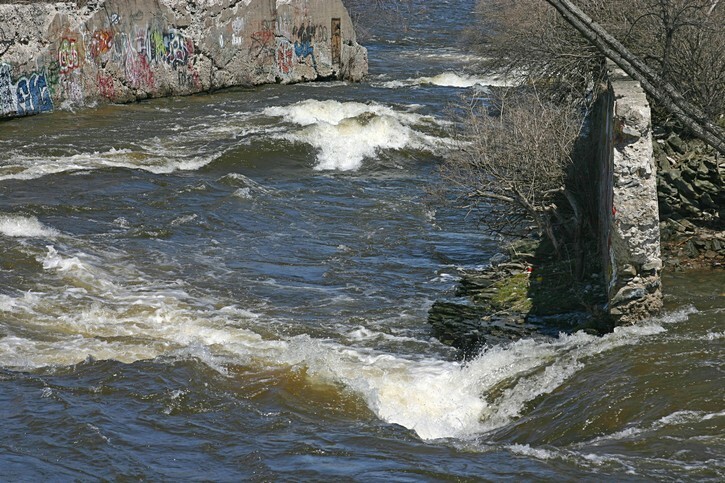 The next point of interest on the Voyageurs Pathway is the Deschênes Rapids. 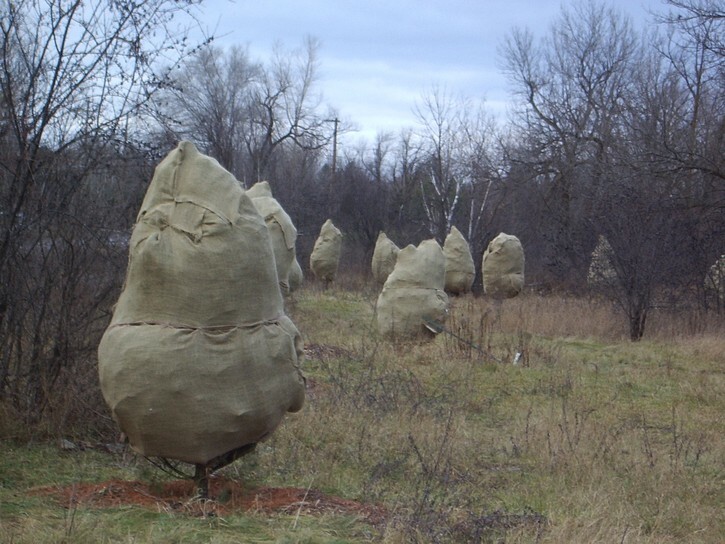 They are hard to miss since the path hugs the shore of the Ottawa River in the area next to the rapids. There are several places to stop and check things out, one of these offers a great view of the ruins of an old dam structure that was built in the late 1800s to harness hydroelectric power from the rapids. 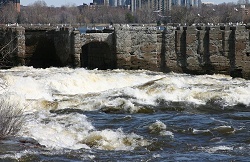 If the water is high and running fast (typically in spring), it is truly an impressive sight to see the force of the Ottawa River as it runs through these ruins. It is worth noting that there were plans to rebuild this dam across part of the river as recently as ten years ago (plans to do so fell apart in the face of local opposition). The river is quite narrow at the rapids, and you can see the Britannia Yacht Club on the opposite shore. The club’s yacht basins trace their origins to excavation work of an abandoned project to build a canal around the rapids. 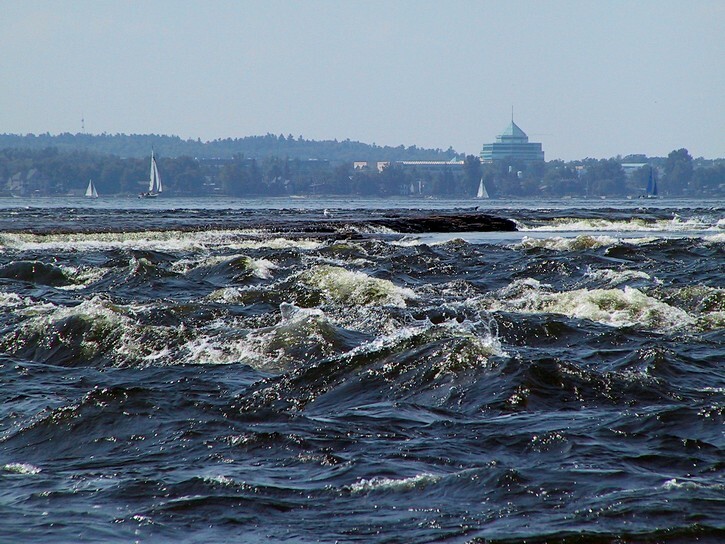 If it is a nice day with good wind, this part of the Ottawa River just west of the rapids (also known as Lac Deschênes) will be teeming with sailboats from the four clubs which are located on this body of water. 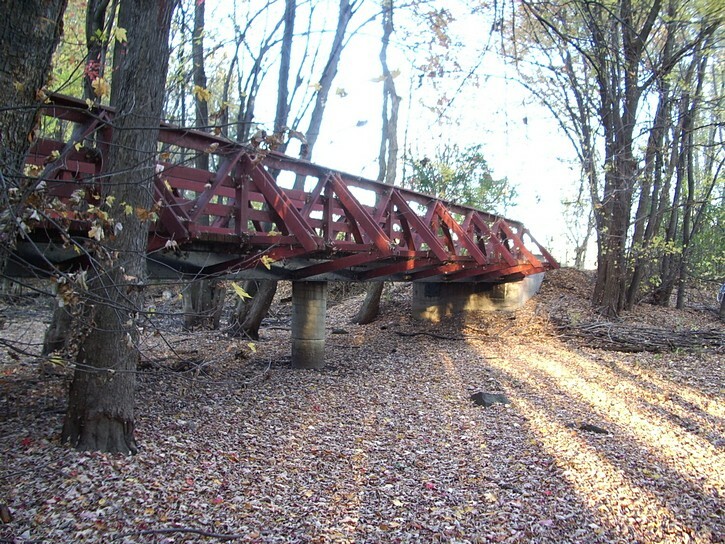 Shortly after leaving the rapids, the pathway comes to a fairly long wooden bridge which crosses over a basin which is wet and marshy during the spring, but usually dry in summer and fall. From here the path becomes less interesting as it moves into an urban setting and parallels Lucerne Boulevard. 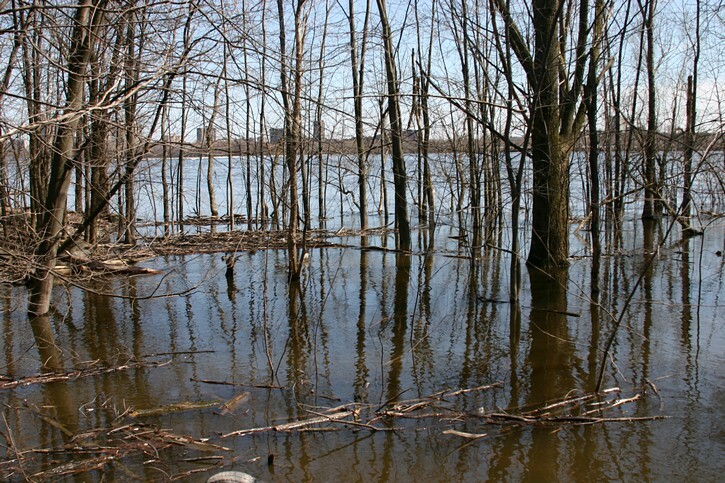 If you stay on the path, it will eventually bring you to the Aylmer Marina on the Ottawa River. 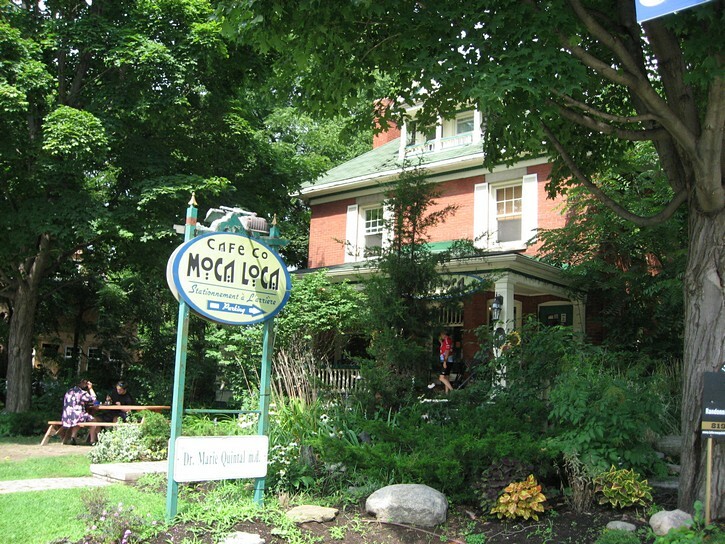 However, if you want to check out Aylmer’s downtown area, keep an eye for where the path crosses a street called Promenade Wychwood (just before the water fountain on the pathway). Turn right onto Wychwood. In about 4 or 5 blocks it will bring you to a tiny city park that’s located on Rue Principale. Opposite this teeny park is a coffee and pastry shop (Café Mulligan) that’s located in an old house, and is a good place for a relaxing coffee or a light meal. Turn left onto Rue Principale, and you’ll be cycling through Aylmer’s downtown area. It has a number of restaurants, several with inviting terraces. 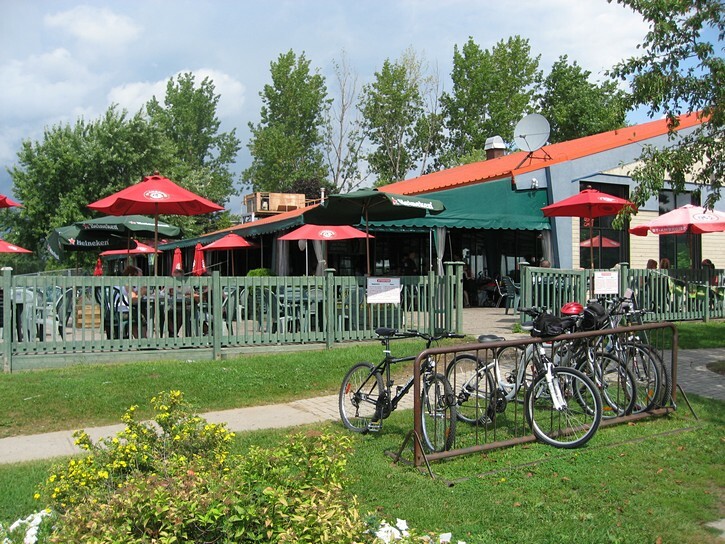 Continue all the way to the end of Rue Principale, and you’ll end up at the Aylmer Marina. 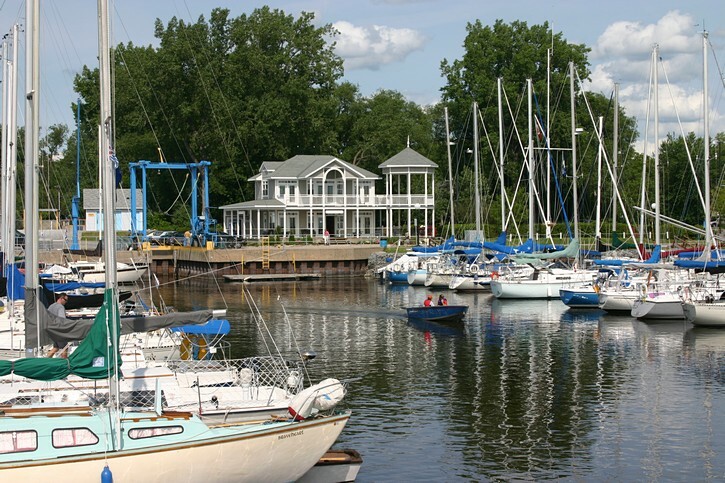 Whether you get to the Aylmer Marina by staying on the path or by taking Rue Principale, you’ll find that’s a natural place to stop to take in the view or check out activities in the waterfront area. In the immediate vicinity of the marina is a large park, a public beach, the Grande-Rivière Sailing Club, and restaurant/bar which features a huge terrace. Because of its location, the Aylmer Marina often serves as a handy turn-around point for people out on a ride on the Voyageurs Pathway. 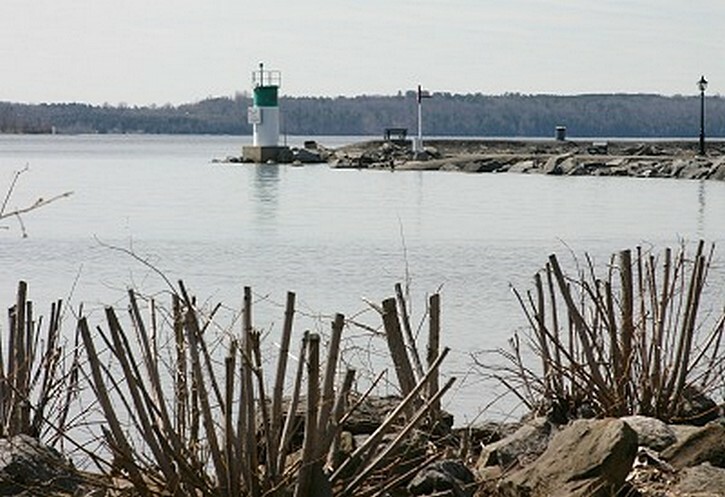 Although many people do turn around at the Aylmer Marina, the pathway continues west along the Ottawa River for close to two kilometres. At the end, it turns inland and connects with the Pionniers Pathway. Here you’ll have to climb a few hills (nothing too steep) and the path will start to veer towards the east. Once on the Pionniers Pathway, you discover that much of it runs right next to Highway 148 (Boulevard des Allumettières), a very busy regional highway. There is nothing really wrong with the Pionniers Pathway, but it’s not overly exciting. The first part (when heading east) is bound by the usual subdivisions, though the does runs through a less developed sector later on. This last kilometre is situated in a nice wooded area, and the pathway more or less comes to an end about two to three blocks west of Boulevard Saint Raymond. It’s difficult to pinpoint exactly where since it a branches out in a number of side paths. At this point you could head east for two or three blocks to get to Boulevard Saint Raymond (there’s a path next to this busy road). From here you could cycle north for a short distance. Within a kilometres or so you should be able to spot one of two different paths on your left (they are well indicated) that will lead to the lower Gatineau Park. 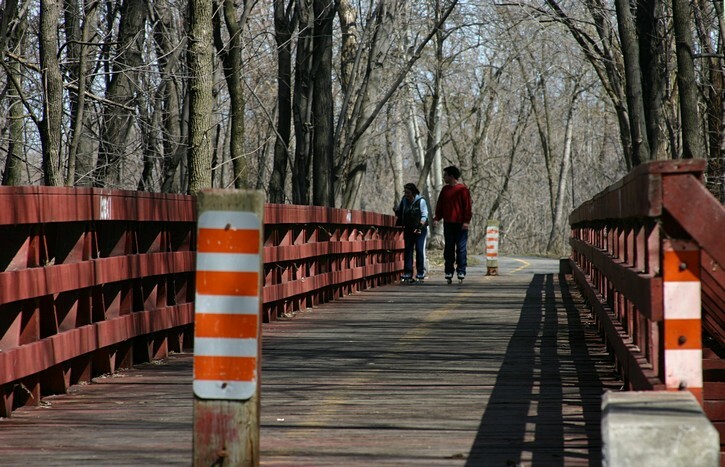 You could then could follow the park’s trail network or parkways south towards the Ottawa River and the Vogageurs Pathway.